Someone tell me who's the 97-win team and who's the 84-win team. Someone tell me why the 84-win team has scored 17 runs in two games against the National League's second best pitching staff. Someone tell me why 97-win team is on the brink of elimination. There are truly no words to explain what's going on here. 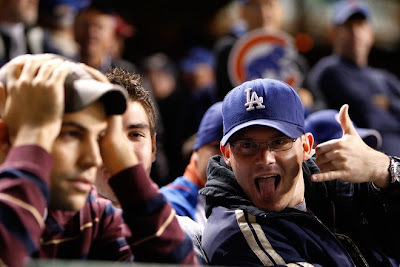 In the end, the Chicago Cubs, who won a league-best 97 games in 2008, are down 0-2 in the best-of-five series, which heads back to Los Angeles on Saturday. The only thing keeping the Cubs from elimination is Rich Harden. But we'll talk about that tomorrow. As for tonight, it's back to drinkin' the hard stuff. It's the only thing keeping me from getting sad over this mess of a ballclub.